It is one of those complex stories that are so difficult to tell, and yet they should, they have to be shared. Imagine the splendid Mekong River, as it flows not far from an ancient capital of Laos, Luang Prabang. The river is powerful, with muddy banks, surrounded by lush mountains. Imagine poor villages and old ferry crossings, as well as broken plastic sandals on the feet of local people. Then suddenly, near the village of Phonesai, you can spot several tremendous concrete pillars. They are growing out from the water, and from both river banks, literally connecting two mountains. Soon it will be a bridge for high-speed trains. It is being built by China, a nation with the most advanced high-speed rail technology on earth. And a bit below, there will be another bridge, for cars and pedestrians. Both mountains are being drilled, carefully and sparingly. This is where two tunnels will be passing through. It is of course much cheaper to blow the mountains down with explosives. But earlier this year, China engraved the “Ecological Civilization” into its Constitution, and what it preaches at home, it also implements abroad. 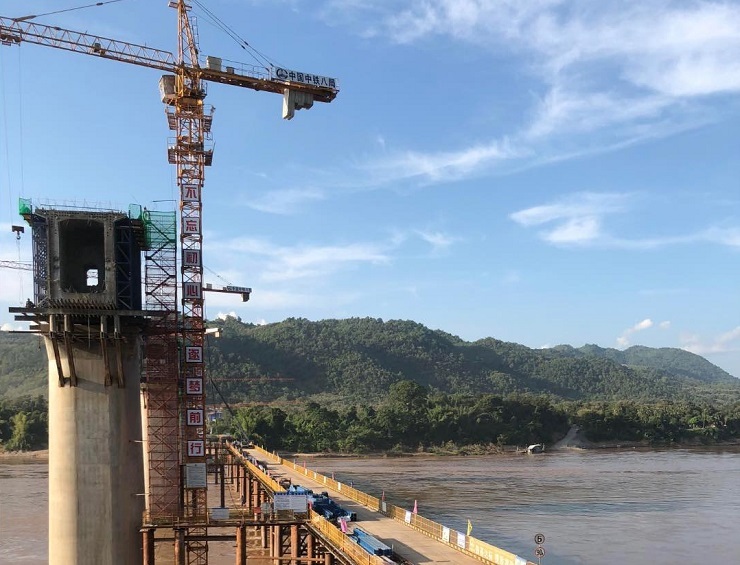 This is the biggest project in the history of Laos, and it is often described as a mammoth engineering task: with 154 bridges and 76 tunnels, as well as 31 train stations. The Laotian terrain is very complex, its nature still pristine at large, and it is supposed to remain as such. The railroad will be 414 kilometers long, connecting Boten on the Laos-China border and the Laotian capital Vientiane. It is estimated that 20,000 Chinese workers will take part in the construction, as well as further tens of thousands of local laborers. The railroad is expected to be operational in 2021, linking Laos with both China in the north, and Thailand to the south. “The Lao government hopes that the completion of China-Laos railway will bring powerful momentum to social and economic development, while the construction of the railway has already brought great changes in many areas along the route. At Sinohydro Bureau 3 Co Ltd’s railway construction site between towns of Luang Prabang and Vangvieng, local staffs outnumber Chinese workers. Nearby hilly villages have over 300 people while some 20 of them have been employed to work for Sinohydro 3. Lao staffs are learning the advanced technology and management from their Chinese colleagues. And not only roads, I saw and photographed new workshops, hotels, small factories and hospitals, along the road from Luang Prabang to Phonesai Village. This is all part of Belt and Road Initiative, an optimistic, internationalist plan of China and its leadership, designed to connect lift out from poverty, a great number of nations, among them various previously colonized and plundered (by the West) countries in all corners of the globe. While the Chinese workers are sweating, constructing the future of Laos, several French-speaking tourists on the main street of Luang Prabang are having beer. In 1995, UNESCO inscribed this ancient capital of Laos onto the world heritage site list. Mass tourism, mainly from the West, followed. Restored strictly the ‘French-way’ into a sentimental, colonialist nostalgia ‘living museum’, Luang Prabang caters mainly to European tastes. The local people are here predominantly to serve, to ‘just be there’ for decorative purposes; poor and ‘native’, humble, selling craft, sitting on the asphalt and making sure to look appropriately destitute but ‘friendly’. There are a few posh boutiques and high-end hotels in town. No Laotian person could ever be able to afford a glass of Belgian beer on offer, or a meal in one of identical ‘traditional’ restaurants. Signs are in English, sometimes in French or Laotian, but very rarely in Chinese. Official Communist flags of Laos have almost entirely disappeared from the main streets of Luang Prabang. Within few years, in the center of the city, the proud Communist legacy and identity of Laos has almost been entirely replaced with mass-produced low-quality silk, banal toys and other kitsch catering to the Western cultural fundamentalists, mainly from Europe. But Laos is a Communist country, and flags are still waving in the wind as a rebellion, from various tuk-tuks and from the houses. At UXO (Unexploded Ordinance) Center in Luang Prabang, I was unceremoniously kicked out, as they were expecting the visit of ‘her royal highness’, Princess Beatrice. A member of the vile British royal family responsible for the horrendous colonialist legacy all over the world world (including Southeast Asia), Ms. Beatrice came to Luang Prabang mainly to attend a charity gala at the newly built Pullman hotel (where I happened to be staying), where she addressed 230 guests, most of them Western ‘expats’ – mostly men who have settled in and around Luang Prabang. Rumors spoke of the possibility of collecting enough money to build a bigger structure for UXO in the city. I used to work in Laos, on several occasions, but especially in 2006, when I reported on the activities of the British de-mining agency MAG, in the devastated Plain of Jars. For many years I have been passionate about this part of the world, trying to understand what really happened during the horrendous ‘side-kick’ wars initiated by the Empire: those in Cambodia and Laos. In a beastly show of cruelty and indifference, the West took millions of innocent human lives in Vietnam, Laos and Cambodia. We will never know the precise numbers, but combined, the death toll of the civilians most likely reached between 5 to 8 million. The West murdered and maimed people, and it poisoned entire huge areas of what was once known as ‘Indochina’. And it got away with it, as it has done in virtually every corner of the world, where it brought genocide, thorough destruction and indescribable misery. I spoke to dozens of local people in the Plain of Jars, using the services of my patient and deeply compassionate local interpreter, Mr. Luong. Western campaigns in this part of the world, got me, this time, absolutely nowhere. Or more precisely, they got me just 5 minutes of a visit to the UXO center. After that I got escorted to my car, so the safety of a member of mass-murderous British monarchy could be guaranteed. Did Laos really need Princess Beatrice? It does not need charity, does it? The UK, together with the US, Australia and few other nations were fully responsible for the death of at least 300,000 Laotian people. The West killed here; it lied, and it has been covering it all up until today. For experimenting on defenseless and innocent human beings, for ruining their land, poisoning rivers, slaughtering animals from the comfortable distance and height of the B-52 strategic bombers flight-paths, in an ideal, or even just ‘normal world, the West should be standing on its knees throwing ashes on its head, begging for forgiveness. Naturally, it should be paying war reparations amounting to trillions of dollars; to Laos, Vietnam and Cambodia. All this and much more it should be doing, to offset at least some of the monstrosities it committed, instead of throwing gala charity parties for the royal mafia, in the middle of 5-star establishments surrounded by local rice fields. But we are not living in an ideal or even ‘normal’ world. The West is unapologetic. Despite everything, it feels morally superior to the rest of the world. It preaches its fundamentalist gospel. And here, in Laos, it is trashing China for pulling this wonderful gentle nation out of decades of horrors, misery and dependency. Western propaganda against the Chinese projects in Laos, is now in top gear. Like in Africa, Western-financed NGO’s are in full force in Vientiane and other cities of Laos. Instead of building or improving Laos, they are there just in order to push the Western agenda; to agitate against the Communist government and its projects and cooperation with China. Bizarre and totally false stories are circulating in many major Western publications, accusing China of virtually everything, from not paying adequate wages, to ruining the Laotian environment. The reason for all this propaganda is clear: Laos is an extremely strategically-located country, bordering China, Burma, Vietnam, Cambodia, Thailand and Vietnam. It is a Communist country. It is still very poor, but with tremendous potential. And now it is clearly aware of the fact that it can soon stand on its own feet. China is capable and willing to transform this country, literally overnight, from a recipient of meager aid, to a powerful nation of 7 million inhabitants. China is involved in building roads, railroads, hospitals, factories, workshops, as well as dams and hydroelectric power plants on the Mekong River. The latter is solving the notorious electricity shortages of Laos, while turning it into a net exporter of electricity, particularly to neighboring Thailand. It is also pulling hundreds of thousands of Laotian people out of poverty. “Protesters paradoxically claim that the dams will disrupt both the environment and traditional fishing communities along rivers downstream from dams. Traditional fishing communities, however, are generally synonymous with both unsustainable environmental destruction and poverty. Conversely, environmental impacts by dam construction can be mitigated through careful planning, while working to lift surrounding communities and the nation as a whole from poverty through improved infrastructure and cheaper and more accessible energy. The West has built nothing substantial in Laos. And it is horrified by the possibility that under the Chinese leadership, Laos will provide an example to the world, proving that even a poor and once destroyed country could stand independent and tall, if it is helped by its mighty, ideologically close neighbor. While the West is helping to build a few services in the old city, mainly for its own tourists and profits, China has already built the efficient Luang Prabang International airport, replacing the old tiny yellowish building that used to serve as a terminal. Railroad and highway projects that will be passing through Laos will connect China with several countries of Southeast Asia, and secure for Laos substantial transit fees. 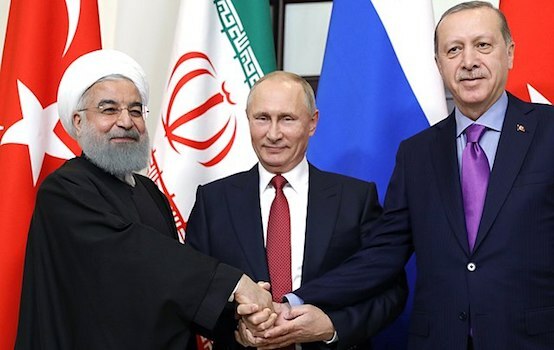 It is a win-win situation, but not when observed from the point of view of those who just want the continuation of Western supremacy in the region and the rest of the world. I checked with a French ACCOR employee who is based in Luang Prabang, and he confirmed the numbers. The conclusions are clear: China pays local people the same wages as they pay to the Chinese workers. The French are paying local staff approximately 25-30 times less than what they pay their own people. But search the net: at least in the English language, and all you will find is an avalanche of fake news about the Chinese involvement in Laos. This is all that the world is allowed to know about this country, and its epic battle for true independence. As always in the Western media: black is white, boys are girls, war is peace, and flamingos are pigs. In the meantime, as I wrote earlier, the Communist flags have almost entirely disappeared from the center of Luang Prabang. It is because, I was told, the European tourists don’t like to see them. Yes, UNESCO supervised the preservation work of the old capital, but what is the result? Sentimental, feel-good ‘colonial charm’; temples, silk shops and cafes with the Western beer and free WIFI. Old Chinese-Lao architecture looks, suspiciously, French. 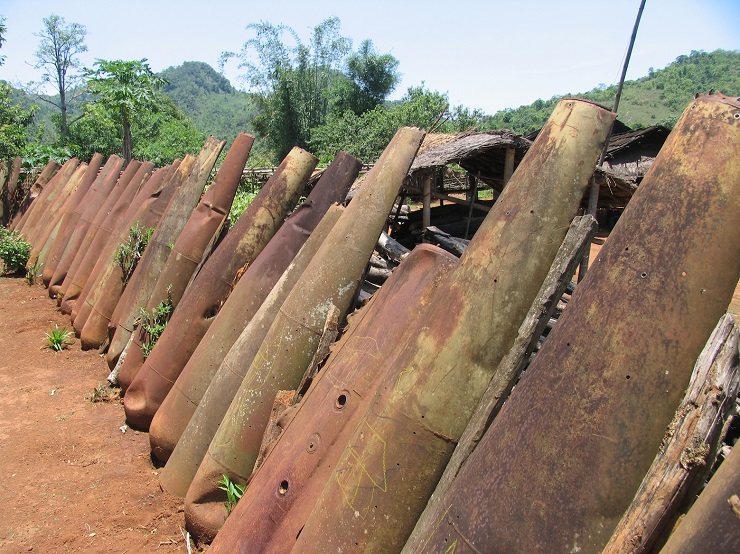 Not a word about the horrors that the country had to go through in recent history; not a word that hundreds of people of Laos are still losing their lives due to the UXO, all over the country. Not a word about the French colonialism, the Western genocide during the so-called “Secret War”, which was unleashed against the defenseless Laos. And yes, not a word about the heroic Pathet Lao, and its superhuman struggle for a Communist fatherland, against the Western imperialist monsters. On the outskirts of the city, predominantly European tourists visit the fake ‘bear rescue center’ (it is really nothing more than a depressing zoo for foreigners), overcrowded waterfalls and caves with religious motives. Hardly anyone goes to the real, tough and beautiful caves, where the Laotian patriots hid while they fought against the West. Now the “National Museum” in the center of the city is basically an implanted (from abroad) glorification of the departed Laotian monarchy. While its shabby theatre shows, exclusively for foreign tourists and at an ‘international price’, several fragments of Ramayana. In the old city, there are hardly any Chinese language signs. Yes, it is paradoxical, as the city is built in a Chinese style, although it now feels ‘colonial’, or call it Europeanized; catering to standardized, mainly ignorant German and French tastes. Lao people are supposed to look native, cute and poor. They do, here in the city. But only for now. A few kilometers away from this pseudo-reality, from this over-sugary and to some extent treasonously demeaning tourist bordello, Chinese signs are proudly displayed, next or underneath Laotian writing. Chinese people, who are engaged in building Laos, prefer to live on the outskirts of Luang Prabang, together with local people, eating their food, sleeping in their guesthouses. The presence of the Chinese engineers and workers is transforming, improving reality. Workshops are growing, eateries flourishing, and the real local economy is growing. Further away from the city, powerful machines are roaring, drilling tunnels, building bridges. Laos is undergoing electrification; it is getting connected to the rest of the world through high-speed railroads and new highways. Schools and hospitals are being built, roads paved. Two Communist countries; two Asian sisters, side-by-side, are hard at work. Nobody chases me away when I photograph Chinese construction sites. Proud smiles welcome me. Workers wave at me, or bow, and then, immediately, they go back to work. There is nothing to hide. There is no time to waste. This is reality; good, progressive reality! Nothing is perfect, here or anywhere else in the world, but this is as good as it gets. I believe it is. I watch a giant construction site and people who are building the nation, raising it literally from the ashes, left by imperialism. The lenses of my glasses get foggy. Mekong is flowing below, and intact, pristine green mountains are resting in a tender embrace of white clouds. I think: “The West dares to talk about ‘environmental damage’ here? Yet they have already ruined, thoroughly poisoned and literally liquidated some of the most pristine parts of the world that I know: Borneo, Papua, the Democratic Republic of Congo! How dare they?” But they do; they dare, and still getting away with it. The nihilism, smear, filth that pours from the muzzles of the West and its regional servants, but it cannot deter this revolutionary optimism, which is so clearly detectable. It is simply beautiful to watch both Chinese and Laotian people working side by side, for a better world. What did the countries that are attacking this tremendous effort, ever do for Laos? What has the West done for the people here? It colonized and enslaved Laos. And then, in one prolonged and truly incomprehensible horror show, carpet bombed, for years, the entire nation, murdering hundreds of thousands, without even declaring war against it! How can the countries that committed genocide against Laos (and the entire world) be allowed to criticize Laos and China, belittling their efforts to improve lives of their people? And how come that Laotian people are still tolerating, even ‘welcoming’ Westerners in places like Luang Prabang, while they show clear disrespect for true essence of the Laotian state, for which so many local people sacrificed their lives? What are Westerners going to teach Laos, what can they teach, really: how to serve, how to be good obedient neo-colonial subjects? Nobody needs that here, except the few members of the treasonous elites. How can people like Princess Beatrice, or any of those ‘royal’ freaks be even allowed on the premises of such places as the UXO? The British royal family is the symbol of global colonialist holocaust. In their name, hundreds of millions of ‘un-people’ vanished, all over the world. In the past, these were only rhetorical questions. Now such questions are being asked, in order to be answered. What goes on in Laos is what I call the war between revolutionary optimism and Western nihilism (my latest book has the same title). 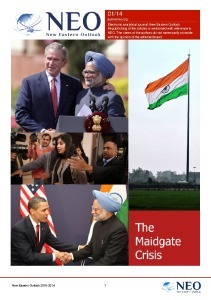 It is the last attempt of the monstrous Western imperialist culture to retain its control over the Planet. Laos, in the past one of the most devastated countries on earth, is not going to allow being lectured to by its tormentor – the West – anymore. In the past, it fought, and against all odds it won. Now it is winning again. But the ‘weapons’ are different than in the days of the so-called “Secret War”: they consist of high-speed railroad tracks, bridges and tunnels, mighty power-plants, hospitals and schools.